A Global Education in a Digital World. Thunderbird Executive Education's online professional development programs are available to global business professionals around the world. These top-ranked programs are accessible, convenient, and up-to-date with the most insightful global business content from the world's #1 ranked school in international business. The uniquely flexible online continuing education programs, combined with unmatched global business content, ensure you are fluent in the language of global business. 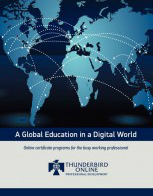 Thunderbird Online's professional development programs provide you with a comprehensive education in core global business concepts to broaden your global mindset, sharpen global skills, and enhance your marketability.